When I pull into our garage at home, I have to make a hard right turn from the driveway. Backing out is an equal challenge. The opening around the garage door is a testament to the several failed attempts over the years to successfully navigate this turn. Unfortunately as a result, I’m on a first name basis with the local body shop. Blind spots are expensive. 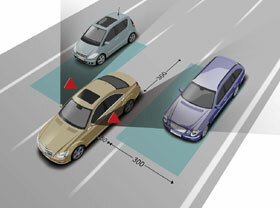 Virtual blind spots can be just as expensive, if not more so. People don’t think about Google or other search engines as having blind spots, but they do. Searching for everyday people is a big problem for search engines, yet “Googling” and being “Googled” are now standard practice for professional, personal and other reasons. We use search engines to learn more about people and validate their backgrounds. And we trust what search engines tell us. In 2008, Google was the most trusted brand in America according to Advertising Age. Worldwide, Google’s brand ranked 7th in 2009 according to Interbrand. Disney ranked 10th. Search engines are typically much better at delivering results for businesses or well-known people. Businesses benefit from their web presence and having unique names (corporations typically cannot have identical names). Having a web presence is required to be relevancy ranked by a search engine, even if that means only having a simple web site. Google even provides instructions for how to improve your web site’s search ranking through a technique called Search Engine Optimization. But most individuals don’t have personal web sites and there is no rule about using the same name for people. As a case in point, there are more than 150 Google Profiles for “James Alexander”. If being visible in search engines is important to you or your career, you need to know how you are presented and why. When it comes to searching for individuals, search engines have three fundamental challenges: 1. Name expansion; 2. Mistaken identity, and; 3. Name entry errors. Name expansion is a big problem. I like to use Carl Mark as an example. Carl is one of the founders of Jones Soda. Not only is this name common (74 Google Profiles so far), search engines use a technology called expansion dictionaries to find variations of each word and then return a name combination that it thinks you meant. In his case, Google thought I wanted to see results for “Karl Marx”. This produced useless results, of course. I understand the logic behind the approach search engines take but it really exposes the fact the search engines have a significant blind spot when it comes to searching for everyday people. Mistaken identity can happen when two or more people have the same name. It can be serious because the results may look like they are about you but are actually about someone else. I read a story recently in which a woman named Lauren Bernat felt her job search was hurt by the search results for someone else with the same name but whose results cast her in a negative light. Name entry errors are a problem for people with names that are difficult to spell. When we were developing Vizibility, I would occasionally hear someone tell me they have a truly one-of-a-kind name and probably wouldn’t need a service like this. I find that level of name uniqueness and spelling difficulty usually go hand-in-hand. If someone misspells a name and doesn’t catch it, they’re going to believe what they see. Search engines are powerful tools that improve our lives every day. We rely on them. We trust them. But search engines struggle for a clear view of the world around them. And unfortunately, if your career depends on them, you want to make sure you’re visible so you don’t get run over. James Alexander is the founder and CEO of Vizibility. A serial technology entrepreneur, James has been involved with Internet search since starting eWatch in 1995. Most recently James served as General Manager of Jupiterimages. Getty Images acquired the company in early 2009. Before that, James was Director of Product Management at Adobe Systems years where he created, built and managed Adobe Stock Photos, which served more than 7,000 creative professional customers in its first 36 months of operations. He joined Adobe in 2001 to manage and build the company’s early-stage electronic book (ebook) business. Prior to Adobe, James led venture-backed Mibrary Inc., a New York-based software start-up founded in 1999 to make electronic books and other digital content easier for consumers to use. Prior to Mibrary, James co-founded the Internet brand monitoring service eWatch, which was purchased by PR Newswire in 1999. James was awarded a patent for search innovations on Adobe Stock Photos and has other patents pending. He earned his Masters of Business Administration with distinction from Saïd Business School at the University of Oxford. He holds a Bachelor of Arts in Political Science from Rockefeller College at the University at Albany in New York.